program for a chronosomatic architectures museum? ...you may have in the past seen me make reference to The Timepiece of Humanity and/or chronosomatics... ...this text comprises the initial results of my 'reading' the hardware and software of the human body as an architecture delivering content. There was also a time when I considered composing The Body, the Imagination, and Architecture were the physiological operations of the body (fertility, assimilation, metabolism, osmosis, electro-magnetism, ultra-frequent synapses) are explored as also engendering 'physiologies' of human imaginations (fertile imagination, assimilating imagination, metabolic imagination, osmotic imagination, electromagnetic imagination, ultra-frequent synaptic imagination) which were then explored as further engendering physiologically categorized architectures (fertile architecture, assimilating architecture, metabolic architecture, osmotic architecture, osmotic architecture, electromagnetic architecture, ultra-frequent synaptic architecture). There are many unpublished notes and some drawings pertaining to this project. the nature of all frequency? 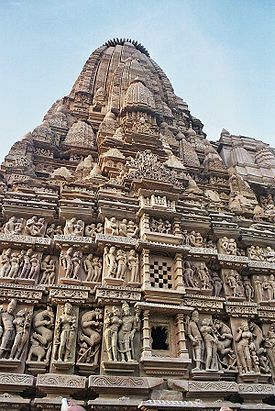 The Khajuraho Temples (circa 950-1150 AD) happened chronosomatically when the plane of the present sliced through the ovaries, hence manifesting an architecture of high fertility. Can there still be an architecture where the fertile imagination is utilized with such profundity? I have some ideas about how to design sacred space, and they have to do with making it osmotic and electromagnetic. Some of Kahn's best architecture is osmotic and electromagnetic. About 180 more years of an architecture dominated by the combined assimilating and metabolic imaginations, and then roughly 500 years of an architecture dominated by a pure metabolic imagination. All the while the profane osmotic imagination remains in the background. So much for the physiology, morphologically a bi-polar structural cage will continue to branch and grow (till completion c. 3091). ..but what about the subcategories of profane and sacred space? Both the profane and the sacred are human "being". Take away the qualifying hierarchy and you'll see the whole picture, which is much more. After reading The Sacred and the Profane perhaps pick up Slovoj Zizek, The Puppet and the Dwarf: The Perverse Core of Christianity. It might help fill out the "whole picture." It was the Hypnerotomachia Poliphili and its profanation of love. "Religion of materiality" and capitalism as today's real religion. The symbolic isn't dead, merely profaned. Just look at higher education as the symbolic profaned via its high price. As to architecture profaned, I'm thinking of something along the lines of how html and the internet profaned publishing. The assimilating imagination and the metabolic imagination are the more profane imaginations, whereas the osmotic imagination and the electro-magnetic imagination are the more sacred imaginations. They can all be utilized when it comes to design. The proposition of a metabolic imagination & an assimilating imagination relative to an osmotic imagination & an electromagnetic imagination stems from the design (morphology and physiology) of the human body. The diaphragm separates the abdominal cavity from the thoracic cavity. The primary operations within the abdominal cavity are assimilation (digestive tract) and metabolism (liver), while the primary operations within the thoracic cavity are osmosis (lungs) and electromagnetism (heart). The diaphragm aids in respiration, defecation and partuition (giving birth). Note how the role of the diaphragm correlates directly to Eliade's 'formula' of transcendence from profane to sacred. The main proposition is that the human mind, the imagination, operates like the body it is bottom up from. In Peircian terms then, the design of the human body is the perpetual index, symbol and icon of human imagination. Really, what boundaries have you pushed? ...you slip a bit in your opening statements (regarding the Ka'ba). You are presuming to know what my understanding of "electro-magnetic architecture" is, thus your comment more only stems from your understanding (--or at least tell us what you see my understanding of "electro-magnetic architecture" to be). It is not the Ka'ba itself that I see presenting a "conceptual wholeness," rather it is the perennial event of which the Ka'ba is the center that presents a conceptual wholeness (of Islam). The Villa Savoye presents an extreme case of assimilating wholeness because the elements of architecture have been so absorbed to the point of 'ethnic cleansing', thus, if not exactly manifesting a 'racially pure' architecture, at least a highly homogenized architecture. I'm still trying to come to grips with "omni-frequency" myself. The gist of the notion, however, emanates from the concentrated confluence of all the senses to the point of an enveloping cognition. To say "that all the wholenesses [I] refer[red] to are "tropic wholenesses"" is to prematurely reterritorialize the "systems". I am not using 'fertile', 'assimilating', 'metabolic', etc. as "figures of speech in which the words are used in a sense different from their literal meaning" (i.e., trope). What I have done is deterritorialize (although still keep whole) the literal meanings of the words (from [describing] operational systems of the body to [describing] operational systems of the imagination). After reading "Postmodern or Posthistoire?" it seems that the notion of posthistory coincides with the hyperactive assimilating imagination over the better part of the next two centuries.